The apartment is located on the 6th floor and can be accessed by stairs or elevator in the building. There is secure entry to the building and private car park to the rear. Guest will be issued a security fob to enter both. There are two spacious bedrooms both with king size beds and large fitted wardrobes. The master bedroom has a fantastic balcony plus a luxurious en-suite shower room. The second bedroom includes a 24" Toshiba LED television with built in DVD player. The spacious living area has a dining table with six chairs, two comfortable sofas and matching arm chair, 50" Panasonic wall mounted TV with DVD channels and additional HDMI sockets plus all guest all guest receive free Wifi internet access. The owner has left a large selection of DVD's, CD's and Books for guests to enjoy. Finally there is a Bose surround sound i-pod docking station. 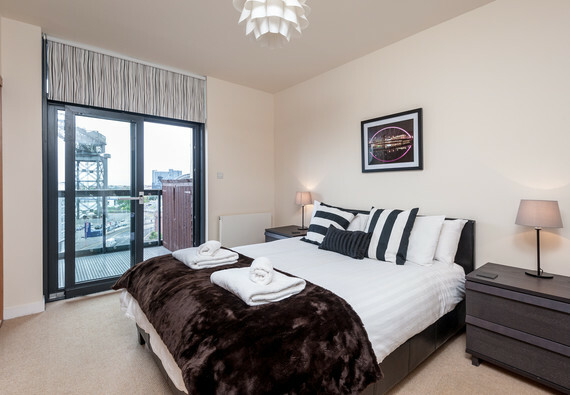 This unique corner property has dual aspect balcony; one river facing and the other Glasgows West End. The open-planned kitchen is adjoined to the living area and includes a fully integrated kitchen, including dishwasher, microwave, oven , hob, fridge freezer and everything you would require for home cooking. The apartment has washing machine, iron and board, clothes horse and hair dryer all located within the storage cupboards. Guests are provided with fresh white bed linen and towels on arrival. Bookings longer than 8 nights will receive a weekly cleaning service. Sleeping arrangements There are two double bedrooms with king size beds. Parking notes There is one private parking space provided in a secure car park at the property. Further details of this will be given at check-in. Accessibility statement This property would be suitable for wheelchair users as there is an elevator from the ground floor to the apartment level. There are no stairs within the property and there is a walk in shower in one of the bathrooms. No reviews yet for Lancefield Quay 3.